Can a plastic orb connect you to the spirit world and lift the future’s filmy veil? OUTLOOK NOT SO GOOD. Can it at least give good advice? REPLY HAZY, TRY AGAIN. Can a toy company make money selling it? SIGNS POINT TO YES! TELL A FORTUNE, MAKE A FORTUNE? Mary Carter had a son named Albert who had little use for any spirits that couldn’t be drunk straight from a bottle. When sober, however, he fancied himself an inventor, and seeing the success of his mother’s Psycho-Slate, Albert Carter came up with his best idea ever: a portable fortune-telling device that any spiritual seeker could use at any time or place. It took some time for Carter to work out the details. It had to look mysterious, it had to offer a variety of answers and, because he had no capital to work with, it had to be cheap to build. He went to work using what he knew best—murky liquids in cans and bottles—and developed what he called the Syco-Seer Miracle Home Fortune Teller—a seven-inch can-shaped device with a glass window on each end. The inside of the can was divided in two; each half contained a six-sided die floating in a dark, viscous liquid (according to some accounts, molasses from his mother’s kitchen) and each of the die’s six sides was inscribed with a short answer. His reasoning for having two compartments isn’t clear, but perhaps it was for efficiency: You could get an answer from one end, then turn it over and get the next answer with little lag time. In 1944 Carter filed for a patent, made a prototype, and began showing it around Cincinnati’s toy and novelty shops. One of the storekeepers, Max Levinson, not only wanted to stock Syco-Seers, he was very interested in helping Carter produce and market them. Levinson brought in his brother-in-law, Abe Bookman, an engineer from the Ohio Mechanical Institute, who suggested improvements to Carter’s design—adding ridges inside the chamber to make the die spin and better randomize the answers. He also hired a designer to give the Syco-Seer’s outer label a mystical appeal. Carter’s patent came through the following year, and luckily for Bookman and Levinson, he had signed rights over to the partnership before he died. Given new creative freedom to experiment with the design, Bookman began making changes that Carter had resisted. First, while the Syco-Seer was attracting curious browsers in stores, it wasn’t generating sales, and Bookman was convinced that it was priced too high. To bring down the price, Bookman reduced costs by cutting Carter’s double-chambered design in half, using only one chamber, one die, and one window. 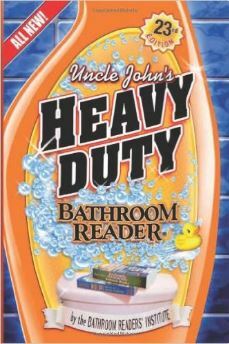 He also decided that Carter’s mother was a good judge of product names. He borrowed her chalkboard gimmick’s name, calling his 3½-inch single-chambered device “Syco-Slate, the Pocket Fortune Teller.” Next, he decorated it with the 12 zodiac signs and an illustration of a gypsy fortune-teller. Place left hand on this end. Ask a “yes or no” question about the future, wait 10 seconds and turn SYCO-SLATE over. Answer will appear on “Spirit Slate” in the window. 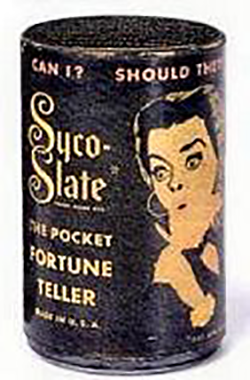 Although the price of the new incarnation was lower, the Syco-Slate didn’t sell much better than the Syco-Seer had. Why? It looked like a can of peas. Bookman racked his brain—what did people expect when they had their fortunes read? Then it came to him: a crystal ball. Late in 1948, Bookman began encasing Syco-Slates in a translucent, iridescent ball. Then he changed the six-sided die to a 20-sided one, and even hired a University of Cincinnati psychology professor named Lucien Cohen to come up with answers for each of its 20 faces. Bookman was sure he had a winner this time. He didn’t. The crystal ball flopped too. Bookman was out of ideas. He’d put a lot of money, time, and sweat into this thing. He was sure it was going to strike it big, yet nothing seemed to work. Then something strange happened, almost as if it had been preordained by the stars: Bookman got a message from beyond—just beyond Ohio’s western border. A representative of the Brunswick Billiards Company of Chicago called to say that Brunswick needed a unique promotional item—would it be possible to change the skin of Alabe’s crystal ball and make it look like a billiard ball? It was a strange request, and it didn’t make sense. Who ever heard of an 8-ball that tells fortunes? But Bookman, looking for a way to make some money and reduce his surplus stock, agreed to do it. Even Madame Mary Carter couldn’t have foreseen that a fortune-telling billiard ball would strike a chord with the public. 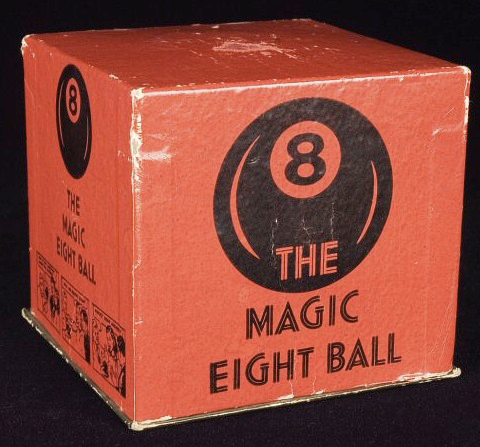 Maybe it was because the absurd 8-ball design stripped away that phony gypsy fortune-teller aura, making the object clearly designed as a fun toy instead of an occult item. By 1950 most Americans were planted firmly in the material world. They might enjoy reading fortune cookies and newspaper horoscopes, but they weren’t trying to get genuine answers or relief from war anxieties. Most saw fortune-telling as something offbeat to laugh about with friends. It turned out that a “Magic 8-Ball” fit right in. The Brunswick Billiards Company quickly distributed their supply, but people were contacting Alabe Crafts asking for more. Abe Bookman was smart enough to recognize that he had a good thing going. Albert Carter’s invention finally found its market. Half of the 20 answers on a Magic 8-Ball are positive. Five are noncommittal, and the remaining five are negative. What’s inside a Magic 8-Ball? First of all, there’s a cylinder that’s very much like Carter and Bookman’s original Syco-Seer / Syco-Slate design. It’s filled with a blue dye dissolved in alcohol. The 20-sided die has raised white letters and openings for the liquid to enter. This makes the die just barely buoyant, which accounts for the way it slowly floats to the top, making the answer gradually emerge from the gloomy dark liquid. There is one recent addition to the original Magic 8-Ball design. When Ideal Toys bought Alabe Crafts in 1971, their designers tackled a problem that had vexed users for decades: annoying bubbles appeared in the message window, making it hard to see the answers. In 1975 Ideal patented the solution—the “Bubble-Free Die Agitator,” consisting of an inverted funnel that routes air into an internal bubble trap. 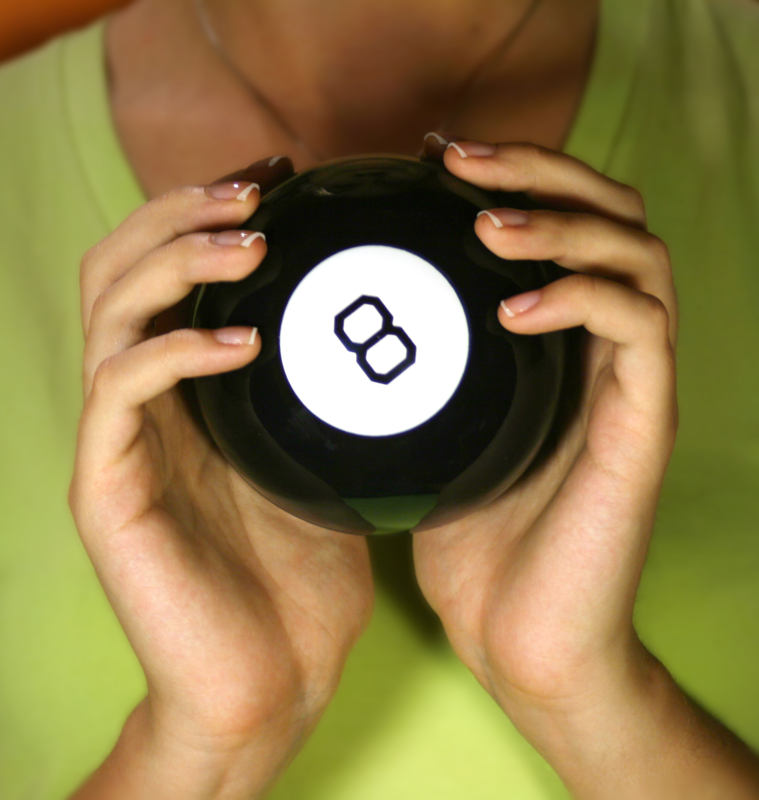 The BFDA has been part of the Magic 8-Ball ever since. Some users seem to think they’re supposed to shake the 8-Ball when they ask their questions. That’s wrong. Agitating an 8-Ball is likely to release bubbles from the bubble catcher, obscuring the words in the inky blue window into the future. If you wanted to get every one of the 20 possible answers, it would take an average of 72 questions. The 20-sided shape of the Magic 8-Ball die is an icosahedron. In the natural world, it’s a shape that shows up in viruses, amoebas, crystals, and a form of carbon called fullerene. In the unnatural world, it’s a shape found in dice made for role-playing games and in Buckminster Fuller’s “Fuller Projection Map,” a nearly round globe that can be opened up and laid flat on a table with very little distortion of the land area’s sizes and shapes. A coincidence? A look into the future? In a wartime short film called You Nazty Spy (1940), the Three Stooges parody Hitler and his henchmen’s proclivity for seeking occult guidance. In the film, a psychic named Mati Herring tells their future with what she calls “the Magic Ball”—an oversized 8-ball that looks exactly like the well-known toy-to-be.